Chintan Chandrachud is an associate at the London office of Quinn Emanuel Urquhart and Sullivan LLP. He holds a PhD in Law from the University of Cambridge, master’s degrees from Oxford and Yale, and a law degree from the Government Law College, Mumbai. His research has been published in prominent newspapers, journals and books, including The Hindu, Public Law, and The Oxford Handbook of the Indian Constitution. He has undertaken several pro bono litigation projects and was chairperson of the Cambridge Pro Bono Project. His book, Balanced Constitutionalism: Courts and Legislatures in India and the United Kingdom, (OUP, 2017) is being released at a function in New Delhi on January 14. LIVELAW: The title of the book suggests that you are more in favour of the U.K. model, which has in fact, given birth to the doctrine of balanced constitutionalism, than the old model of striking down of primary legislation in India. Is there any lesson to be learnt by India from the U.K. model of declaration of incompatibility with Convention rights? 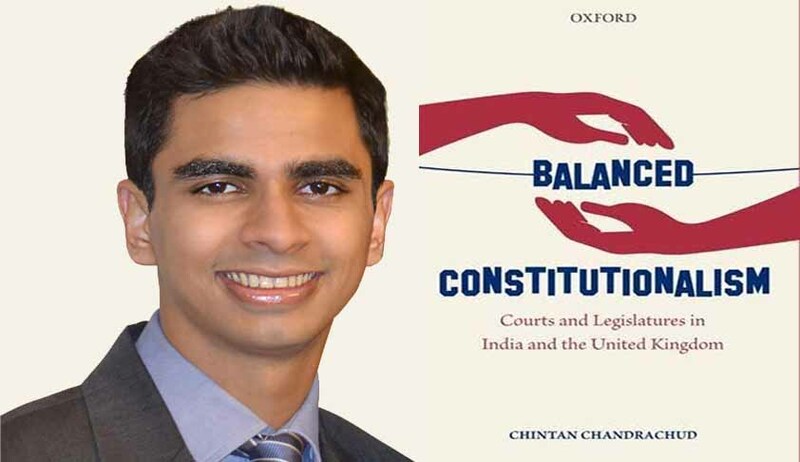 CHINTAN CHANDRACHUD: If you consider it a virtue for courts and legislatures to have an equal opportunity to interpret the Constitution and articulate their understandings of rights, the UK’s model performs better than the American-style model of judicial supremacy in India. However, the fact that the UK model is more conducive to balanced constitutionalism is something of an unintended consequence, particularly if you consider what scholars had in mind at the time at which the UK Human Rights Act was enacted. The UK Human Rights Act excited interest amongst scholars on account of the fact that the the remedy – the declaration of incompatibility – left Parliament with the choice of deciding whether to comply with the Court’s decision. However, what you see in practice is not very different from what transpires in India – in an overwhelming majority of cases, declarations of incompatibility are complied with, much like judicial strike downs in India. On the other hand, declarations of incompatibility enable British courts to articulate their understandings of rights in circumstances where Indian courts- armed with the power to strike down legislation – consider it difficult to do so. LIVELAW: According to you, evidence suggests that the Indian Parliament responds slightly quicker to judgments striking down legislation than the British Parliament to declarations of incompatibility. Do you mean response in terms of undoing the striking down judgments through fresh legislation or amendment? But you also observe that the most common political response in both the jurisdictions is to comply with the court’s judgment. Have you been able to look at the data regarding the number of times Parliament has sought to undo striking down judgments from the Supreme Court, by changing the basis of these judgments? Is Appendix A in the book an exhaustive list? It seems to stop at 1990. CHINTAN CHANDRACHUD: To start with, the most common response in both jurisdictions – the default position, if you will – is to comply with the court’s judgment, whether in agreement, disagreement or indifference. Considerable political traction is necessary to overturn a judgment striking down legislation (in India) or a declaration of incompatibility (in the UK). From the data I considered, I found that when it has chosen to respond to a judgment striking down legislation, the Indian Parliament has done so more swiftly than the Westminster Parliament responding to declarations of incompatibility. The reason for this becomes clear once you consider how burdens of inertia are distributed when a declaration of incompatibility is made compared to a judgment striking down legislation. A judgment striking down legislation usually takes immediate effect, and it is in the interests of Parliament to respond as swiftly as possible to alter the state of the law. On the other hand, declarations of incompatibility take effect only once implemented through remedial orders or legislation. It is therefore in the interests of an unhappy government to delay implementation for as long as possible. Appendix B in the book contains an exhaustive list of political responses to all declarations of incompatibility made since the UK Human Rights Act was enacted. Appendix A, on the other hand, contains political responses (through constitutional amendments) to judgments selected based on certain criteria set out in the book. For a variety of reasons that I explain in the book, such responses have been in short supply in recent years. LIVELAW: Your book, coming almost one year after the striking down of the NJAC Act by the Supreme Court in October 2015, could have helped the reader to understand the nature of this striking down better. Have you chosen to keep NJAC out of the book, because the after-effects of its striking down are still unfolding? CHINTAN CHANDRACHUD: Yes, that was one significant reason for keeping the NJAC judgment out of the book. The after-effects of the judgment are still playing out, and we will only be able to understand them a few years down the line. LIVELAW: In the days preceding the Supreme Court’s delivery of the judgment in the NJAC case, the debate was on whether the pre-amendment clauses would revive itself, if the NJAC Act is struck down by the Court, and whether the Supreme Court’s judgment in the Second Judges Case too would revive itself, thus recreating the Collegium, which was eclipsed. How do you look at the way the NJAC judgment resolved these issues? CHINTAN CHANDRACHUD: The issue was quite straightforward. Once the Court decided that the constitutional amendment was invalid, the interpretation that applied to the existing constitutional provisions would continue to operate. Whether or not you agree with the NJAC judgment itself, it is difficult to dispute that the logical outcome of the Court’s decision is that the collegium would remain in place. LIVELAW: You observe that rise of coalition Governments after the 1980s, and the simultaneous increase in the legitimacy of the courts rendered it difficult to respond to judgments striking down legislation in India. But the contrary, the return of the single party majority Government in 2014 at the Centre has not made it easy for Parliament to respond to striking down. The NJAC case supports such a view. CHINTAN CHANDRACHUD: There are a number of factors that have made it difficult to respond to judgments striking down legislation. These include the difficulty of securing large parliamentary majorities and the rise of coalition governments, the increase in the Supreme Court’s institutional legitimacy, plenary bottlenecks in Parliament, and public pressure. While the emergence of the a single party majority has influenced this dynamic, the other factors still constitute a strong deterrent against responding to judgments in strongly adverse terms. LIVELAW: In the UK, according to you, the public pressure following a declaration of incompatibility as well as the looming spectre of the Strasbourg Court has made open defiance of declarations of incompatibility a difficult choice to exercise. Is public opinion a deterrent in India against Parliament’s swift response to a striking down from Supreme Court? CHINTAN CHANDRACHUD: Yes, public pressure combined with the rise in the legitimacy of the Supreme Court also makes it difficult to reject judgments striking down legislation in India. A good example of this comes from the events following the Lily Thomas case, in which the Supreme Court struck down a statutory provision protecting sitting MPs from immediate disqualification for committing a criminal offence. The government’s attempts at amending the law, first through primary legislation and then through an ordinance, were quelled through public pressure despite widespread parliamentary support. LIVELAW: The book has a separate section on the NHRC’s role. To what extent, it has successfully performed/performs its intermediate remedies falling short of the power to strike down legislation? You observe that in the context of its vast range of functions, NHRC has been quite successful, although it has found it difficult to influence the Indian Parliament to amend the law, based on human rights concerns. Does NHRC require systemic remedies? CHINTAN CHANDRACHUD: The NHRC has a remarkably wide mandate, which includes inquiring into individual complaints, intervening in human rights proceedings pending before the courts, visiting jails to examine the living conditions of inmates, studying international human rights treaties and making recommendations for their effective implementation, spreading human rights literacy, and encouraging the efforts of NGOs. Within its vast range of functions, the NHRC’s focus has been on addressing individual complaints of human rights violations. In the book, I explain that the NHRC has performed quite well in the context of this wide range of functions. That the NHRC has found it difficult to influence Parliament to amend the law may indicate that either systemic remedies (predominantly, a narrowing of mandate) is in order, or that a reallocation of resources may be necessary. LIVELAW: Your book compares the Naz Foundation and Bellinger cases, and you suggest that the House of Lords in Bellinger, unlike the Indian Supreme Court in Kaushal, brought its rights reasoning to bear. Then you suggest that had the Indian Supreme Court been empowered to make a formal declaration of incompatibility (carrying the same institutional rigour), it might have been tempted to do so in Kaushal, so as to compel Parliament to deal effectively with the collateral consequences, produced by making any changes to section 377 IPC. Are you suggesting that both striking down and where it is not possible, formal declaration of incompatibility, can coexist in India? CHINTAN CHANDRACHUD: My starting premise is that the Koushal case was clearly incorrectly decided. However, if we were to accept the Court’s (factually mistaken) concerns that serious collateral consequences would follow a striking down of section 377, a court armed with the power to make a declaration of incompatibility may have been tempted to do so. This should not, however, be taken to indicate that the declaration of incompatibility can co-exist with the power to strike down legislation. In fact, it may be difficult to sustain these two remedies in a system of judicial supremacy that acknowledges that courts hold the responsibility of policing the boundaries of the Constitution. It is also useful to remember that the the wider institutional environment contributes to the authoritative force of a declaration of incompatibility in the UK. Transplanting the remedy into another jurisdiction that lacks a similar institutional environment may result in the remedy functioning quite differently.